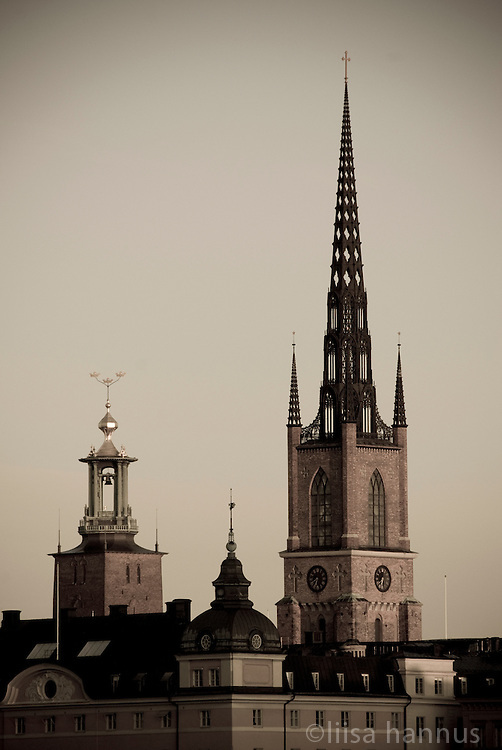 Located on Riddarholmen (The Knights' Islet), Riddarholmskyrkan (Riddarholm Church), on the right, has been the royal burial church since the 16th century and is where a number of Swedish monarchs lie buried. Completed in 1923, Stockholms Stadshuset (City Hall), on the left, stands on the southern tip of Kungholmen island and is the building of the Municipal Council for the City of Stockholm. It is also the location of the Nobel Prize banquet as well as being one of Stockholm's major tourist attractions.